Following the iconic 1968 film, the Planet of the Apes franchise quickly tanked in the 1970s with endless hammy sequels, and Tim Burton's remake in 2001 only made audiences detest it even further. Reviving the series with stunning motion capture performances and a fresh take on the origin story, 2011's Rise of the Planet of the Apes spearheaded a new stage of the franchise that was actually on its way to naught but success. And such success continues flawlessly with this 2014 sequel, Dawn of the Planet of the Apes. Eight years after the simian flu virus spread across the globe, countless humans have been killed off and countless apes have grown as intelligent and capable as their homo sapien relatives. Lead by Caesar (Andy Serkis), the ape colony thrives in peace on the outskirts of San Fransico; but their tranquility is soon disrupted by a band of human survivors lead by Malcolm (Jason Clarke), who are attached to a colony lead by Dreyfus (Gary Oldman). Both races manage to coexist in peace, but this soon collapses into all out war to eventually decide the dominant species of Earth. Dawn of the Planet of the Apes branches away from the tone of its predecessor in the best possible manner, taking the story in a gripping new direction that nicely develops the basis of the entire franchise. 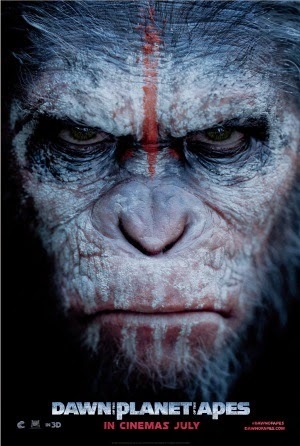 James Franco and the original cast are long gone to make way for an even bigger focus on the apes and for a new band of human characters; while the apes flourish with stunning performances and fantastic motion capture CGI, the humans suffer from bland characterisations that, while likeable, fail to generate much interest when compared to Caesar and his tribe. Jason Clarke gives it his all but doesn't really stand out with the content he is given, and Gary Oldman tragically has nowhere near enough screen time, even though his character is one of the films best. The story is intelligent and emotional without being pretentious; it remains action packed and thrilling, but audiences can fully invest into the characters with ease thanks to the excellent script and Matt Reeves' stylish direction. To have CGI characters act alongside real people is a hit or miss scenario; audiences can tell when a rendering isn't textured or lit properly, and Apes has its moments of being obviously synthetic. For the most part, it looks incredible, and Serkis continues to show that motion capture performance can be just as credible as traditional acting. The story is nothing like what you see in the trailers: expect something very different, but this is by no means a bad thing.